Global heat map, 03 July 2018. SOURCE: University of Maine Climate Reanalyser. I’ll start this when it was cold, especially cold in the central and eastern half of the United States at the start of the New Year’s Eve celebrations. The most famous one huddling a few million for warmth in Time Square, New York, waiting for the light ball to slide down the ice-cold, windswept pole heralding midnight and the new year 2018 in what was one of the largest and coldest New Year’s outdoor public parties on record. It was on many people’s minds, the doomsday movie quality of it… The storm surge flooded the shoreline of Boston and all across Northeastern US Atlantic coastal areas. And the wind! Cape Cod Peninsula and Nantucket Island were clocking sustained Category One hurricane force winds at 76 mph. There was only one major perversion in this picture and it rivaled some of the best Science Fiction doomsday weather movies. This hurricane was made of snow and ice. Rather than being fed by tropical warmth it was sucking up moisture from the warm Gulf Stream current like a normal hurricane “and” abnormally sucking down polar cold from the Arctic. Witnesses to the storm on the Weather Channel and other stations remarked how it was like something they’d seen in a movie. I know which movie they were probably talking about, The Day After Tomorrow. The same common sense that looks at the flat horizon thinking the Earth is flat would assume, as many readers did, sharing their common sense, that this record cold snap and blizzard was proof that no global warming existed. An ice age approached. Sometimes objective scientific forecasts can sound as far-fetched as seers peering into the future. Two objective and completely subjective fields will tell us to look beyond the icicles on our noses at what is actually coming, and it isn’t a new ice age. One extrapolates data, the other uses a mysterious facility of intuition to leave conclusions about what that scientifically collected data will find days, years, even centuries before a scientific report gathered it. Both disciplines are equally valuable. True future intuition is Trust. Objective scientific exploration—is the verification. Almost seven months ago, I forecast in the coldest days of January 2018, the hotter future coming. Three months later erupted 90-degree heatwaves at the end of April into May for the US Eastern Seaboard States the Snowercane had earlier chilled and packed in snow banks. Then came summer suddenly, with a spiked punk rocker’s scarlet mohawk of record breaking temperatures starting end of June and prickly heating the Northern Hemisphere unrelentingly to this day into August 2018 with its historic overwhelm of long-held national and international heat records. Toto, says Dorothy, this is not Kansas anymore, under snowdrifts. This ain’t The Day After Tomorrow ice age cometh. Conjure up now another kind of cinema “science fiction” scenario where the heat and extreme weather of the Northern Hemispheric summer of 2018 melted from our memories the “Snowercane” of January faster than a snowflake falling on a hot stove top. Trump will get more than a “little bit” of global warming. The US increased pollution levels will accelerate the permafrost eruptions across the Arctic of millions of tons of methane, an even more powerful planet-heating gas, added to the CO2, because Trump’s fossil fuel friendly plans for rebooting the US economy will increase the US carbon emissions by 19 percent. It could very well be the cause of further weakening of the Polar Vortex bleeding more cold snaps outside his White House window strengthening his resolve to drill baby drill and burn exhaust pipes burn the world into a far hotter future that humanity might not be able to control. I would even venture that you’ll suffer more weakening Polar Vortexes bleeding out arctic storms this winter. Be forewarned and prepared. The climate signs are showing to me that by March into April will see a sudden and dramatic heating up of temperatures. Fast forward three months and three days later into the hot dog days of summer and news coming in from across the Northern Hemisphere since late June through July is as breathtakingly Scy-Fy as a triple-digit, asphalt-melting day in Los Angeles in early July 2018. It just doesn’t get that hot and stay that scorching just below or on the triple-digit weather for a week or more, even in LA, my city of origin where I lived through 25 summers. I’m going to take you on an overheated engine flight around the northern half of this planet where the weather is waxing apocalyptically hot and extreme. Just as climate scientists a quarter century ago foretold the sign that global warming is accelerating is here. It has appeared in the guise of a massive high-pressure heat dome. It laid its lid of hot air across two thirds of the US. Denver, Colorado, tied its all-time high temperature record of 105 degrees Fahrenheit on 28 June. The unnaturally sultry night of 2 July in Burlington, Vermont marked it warmest low temperature on record at 80. On that same day farther north of Vermont in Canada, Montreal reported its hottest all time temperature since records began 147 earlier, of 97.9 degrees. It also posted its highest midnight temperature “and” humidity reading. Similar record humidity and heat index reports reached as far north as once cold Canada’s capital of Ottawa. One of the things millions of football fans (soccer for my US readers) unexpectedly enjoyed at World Cup games played across European Russia from St. Petersburg, and Moscow to the north, Samara in the deep northeast and down to Rostov and Sochi in the Russian southeast were a month of unseasonably hot and lingering heatwaves from mid-June through mid-July. It helped people party late and hard into the white Russian nights, but in Quriyat, Oman in the Middle East around 28 June, you wouldn’t want to be partying too hard. 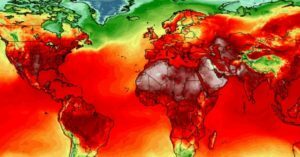 The town achieved the dubious distinction of clocking the planet earth’s hottest recorded low temperature in human-chronicled history: 109 degrees (42.6 Celsius). To Gain FULL ACCESS to all four articles with a $5.00 to $10.00, Donation. I will send a PDF attachment. Time to Donate for July-into-August Articles. Today’s articles are the first of several waves of articles I started researching and writing at the end of July that were published now. The next wave will also include Part Two of my Anthony Bourdain Essay. You can further help fund HogueProphecy’s major summer upgrade, by giving $50.00 donation or a little more to get Full Access to all planned July-into-August articles in PDF files when published. Put July and August in the PayPal Memo line. And finally, for a $100.00 donation inside the US ($130.00 outside) get all July-August articles downloaded as PDFs AND also receive a personally-signed Hogue printed book of your choice mailed to you. Put July and August Book in the PayPal memo line. For a book list see my Amazon Author’s Page. DC Court of Appeals Justice Brett Kavanagh and family with President Trump. Justice Kennedy retires: Is Roe v. Wade in Danger? Trump’s base wants it overturned and given “The Donald” in Chief’s consistent follow-through with his campaign promises to his base voters, there is understandable angst that he’ll pick a Roe-v-Wade busting judge faster than you can back America out of a nuclear deal with Iran. Some progressive sources cite the following evidence of him promising just that. In his first major interview after winning the election, Trump in mid-November 2016 appeared on 60 Minutes (CBS) and implied to Leslie Stahl that he aimed to stay the course of his campaign promises to seek pro-life justices for the Supreme Court. The president elect at the time was talking about being all right with a scenario where women could still get a legal abortion in mostly Blue states that support it, making a woman’s right a state’s right rather than federal. It is assumed then that the Red states that voted for Trump would generally make abortion illegal. The issue before us to forecast is whether the Roberts Court will overturn precedent and reverse one of the Supreme Court’s landmark rulings of the latter twentieth century. To overturn such would risk undermining the credibility of the SCOTUS being a non-partisan body. Chief Justice Roberts in his own rulings has backed away from upsetting the court’s dispassionate appearance more than once, especially in efforts by Republican lawmakers in US Congress to overturn the Affordable Health Act during President Obama’s two terms. 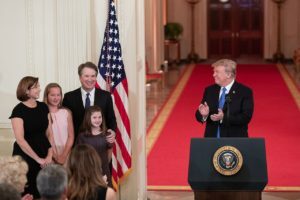 Yet here comes a potential candidate in Brett Michael Kavanaugh, one of retiring Justice Kennedy’s law clerks and current member of the US Court of Appeals for the District of Columbia Circuit. Is he truly partisan? Has he no scruples in overturning precedent for his pro-life stance, in other words, putting his religious views over secular laws undermining the Constitution’s separation of Church and State? The primary astrological influence for the coming 18 months or so is dominated by the early degrees of the transit of Uranus in Taurus and the final degrees of Saturn’s transit in era-defining Pluto. They will play the alpha and omega of two cosmic forces that might influence malleable minds of the robotic and unconscious human masses, be they leader or the led. Passing through earth signs they decide where the law comes to ground and roots there for generations to come. Saturn in Capricorn holds the ground of status quo, legal precedent. Uranus in Taurus, however, is in its fall. Does that mean Roe v. Wade falls with this planet active with an urge to change the ground of historical precedents? Roe v Wade was born under Uranus in Libra the Balancer. It ruled a time of opening people’s minds to new forms of relating in personal and sexual freedom. Uranus has just begun its long transit through Taurus which will last through Trump’s first and potential second terms. Uranus in its fall can become an individual’s freedom buzz killer. When last it was in Taurus it solidified the spread of the last wave of Fascism in the world. It could repeat the rise of same throughout the first half of the 2020s. It favors frustrating free expression, individual rights and privacy, as we see already happening. But will that equate to a contradiction in legal conservatism which has honoring precedent law…? This video report posted in early July from PBS journalists is going to be hard to look at for many of you. Please face this nonetheless, especially if you are a citizen of America or of the United Kingdom. Both your governments in your name are arming the Saudi Arabian military, along with their Egyptian and Gulf State coalition allies, taking sides in a civil war in Yemen since 2015. The Saudi blockade of Northern Yemen against the Houthis has in the last year descended into something so ruthless and complete that a premeditated and catastrophic loss of civilian life is about to happen not seen since the Second World War. The Saudis with American and British help are waging genocide on a military industrial level that could soon exceed the loss of life of Hitler’s starving to death over a million Russian citizens during his siege of Leningrad (St. Petersburg) and his premeditated murder of six million Jews. And this time the murders aren’t by Nazis but US and UK allies. This time the bullets aren’t German. US and UK weapons contractors are hauling in billions of US dollars and British pounds in profit. This following link to the PBS episode, the first in a series, is perhaps the most time and footage any mainstream news network has dared show you from ground zero—the areas occupied by the besieged Houthis holding on in the northern half of Yemen. The reason being that the horror is so complete and manmade that even this mainstream network, albeit the least watched of the main networks in American and the BBC in Britain, had to show this. On average in the last 12 months, Fox, CNN, MSNBC and the big three US networks reported next to nothing about this terrible war that the United Nations has declared as the worst manmade human disaster of our time. Moreover, when they do report you will rarely if ever here how deeply involved Britain and the US governments are in making this disaster possible under your flags and your names, if you so identify with such. Not only are billions of dollars of profit going to US war contractors for the last three years to arm the Saudi’s in this war, but US forces are actually involved. They fly reconnaissance missions to tighten the blockade. They fuel the US-built Saudi bomber jets in the air over Yemen. Those bomber jets for a few years now have systematically destroyed the means for non-combatant Houthis to sustain what had already been a meager survival in the Middle East’s most impoverished country of 27.58 million people. The Saudis fueled and targeted by US help and using many US manufactured ordinance banned by the United Nations, such as cluster bombs and phosphorus, have systematically destroyed all the water purification plants, the sewage systems, the governmental systems for public support, then the schools—they’ve even obliterated wedding parties for maximum loss of life! The Saudi’s don’t only want to help whom they support, the Sunni Muslim southern Yemenis win this civil war, they want to wipe the Shia Muslim Houthis out of existence. If nothing is done between now and the end of the year to put pressure on the UK, UK and Saudi governments to desist from this genocide, more innocent men, woman and children will be starved to death and murdered than all the Slavic and Jewish noncombatants of the Nazi death camps put together. Rather than Americans and British fighting to defeat this monstrous act, their war industries are profiting from it, their governments are tacitly allowing it and in the case of the US, even their special forces are on the ground in Yemen sometimes directing and participating in this siege of Northern Yemen and a complete blockade of the one port the Houthis have left to receive any food, medicine or water from the outside world. As I said, the Americans made the bombs that wiped out the water and sewage systems. Made in America ordinance has since unleashed the largest outbreak of cholera in human history. The WHO (World Health Organization reports 612,703 confirmed cases but suspect that since April 2017 to mid-February 2018 the estimated number has swelled with an additional 1,055,799 cases. Given the Saudi siege tightening since February, there can be easily another million infected with this highly contagious and deadly, dirty water-borne fever plague. Add Starvation to a cholera plague as a Saudi weapons used to weaken not only the resolve of the Houthi people to endure war, but to exist. The Saudis lamely claim that the Houthis are being backed and armed by their chief nemesis in the region, the Shia minority Muslim sect’s most powerful nation, Iran, even though the Iranian connection, so far hasn’t been proven. True, one will hear the Saudi propaganda press say often that Iran is shipping regional ballistic missiles into the Shia Houthi held regions who then fire missiles deep into Saudi Arabia territory. When the Saudis declare, the US and UK press ape the claim without skeptical inquiry. They don’t tell you that the Yemeni military in the 1970s had stockpiled a very large arsenal of the same Soviet-era scud missiles. The Houthis side captured most of them and now shoot slightly augmented versions of these over the Saudi border at their invaders (see Yemeni missiles). The US media doesn’t question how the Houthis can smuggle hundred-foot long missiles needing cargo ships and massive trucks to roll them across Saudi and South Yemeni defense lines when the ports are closed so tight that not even small carboard boxes filled with medicines or food can enter. The Saudi Crown Prince Muhammad bin Salman (MBS), the de facto power behind the throne of this stroke-ridden father the Saudi King, is the arrogant man responsible for starting this war that he boasted in 2015 would end in Saudi victory in three months. The boast sounds a bit like Hitler’s goofy declaration in 1941 that he could take down the Soviet Union in only eight weeks. MBS and Hitler have a lot in common. Click on this link and Learn how to free yourself from the Antichrist Unconscious. Click on this thumbnail cover. They share many of the same prophetic warming markers of Nostradamus to become two of his three candidates for Antichrist famously foreseen (and accurately in the case of the first two). The first was Napoleon Bonaparte (PauNayLoron=Napaulon Roy, “King Napoleon”). The second, Adolf Hitler, code named “Hister.” After 32 years of doing detective work to unmask the third and final Antichrist, code named Mabus, I have concluded that MBS—M(a)B(u)S—is candidate number one for Nostradamus’ final Antichrist. Muhammad bin BS’s ongoing Yemeni Houthi holocaust will soon put him on the same level of mass murderer of innocents as Nostradamus’ second antichrist, Adolf Hitler who also effectively waged genocide against another group of Semitic people, the Jews, killing 6 million, half of the Jewish population of Europe, from 1939-1945. Like MBS, Hitler also managed to do his killing for years with little to no press coverage in Britain and American. Hopefully it won’t end the same way with the Houthis as it did with the Jews of Europe. I don’t want to see history repeat itself with the press giving a new genocide maximum coverage after their bodies by the millions were discovered at the war’s end. 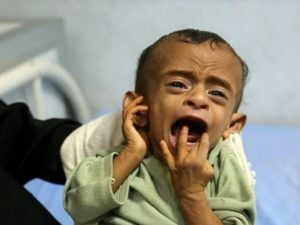 If no coverage and public ire is ignited in American and Britain to stop this madness, then Crown Prince Muhammad bin Salman is poised to kill eight to 12 million Yemeni civilians beginning a mass-dying-off cascade starting perhaps as early as the end of 2018, just six months away. American and British people, your governments and your mainstream media, have kept the images I’m linking you to from PBS willfully out of your attention. The Saudis, especially under MBS, give the corporate US media a lot of cash support, as do the US weapons contractors that profit from these Yemeni deaths and the fossil fuel companies that advertise on their stations. The only reason you’re seeing this much footage of the starving and sick Yemeni civilians on this PBS report is because half their funding comes from public donation. Public donations to HogueProphecy.com is why I exist to tell you the truth about this. Don’t be like the so-called “good” Germans who said they never knew Hitler was killing Jews by the millions because they weren’t informed it was happening. Write your media, write your congressional and parliamentary representatives and petition your president and prime minister denouncing this Holocaust active in your times committed by your governments’ hand. Good Americans and British people, I trust you will not hide your head in the sand about this ongoing Yemeni holocaust, like the good Germans under Nazi tyranny did until the victorious allies, your grandfathers and great grandfathers, had to drag these “good” Germans by the collar to the nearest concentration camps to wake up, smell the dead and bury them with bare hands. The next wave of postings for the new month of August will include PART TWO of this provocative and thought-provoking look at two kinds of suicide, one where you don’t physically survive it, and the other where your misery-identity doesn’t survive it. See a vision from the new humanity’s point of view that doesn’t look at suicidal thoughts as taboo. The impulse to kill oneself, if deep and penetratingly confronted, can be a sign of latent, innocent intelligence trying to break free from all the identities and suffering that current human society conditions us to “do” as a habit, rather than understand that misery “undone” does not touch the eternal light within us. 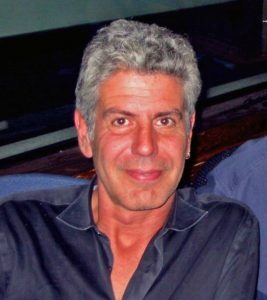 If you’ve missed reading Part One of my Bourdain essay and aren’t already on my July-August Full Access donor’s plan, Part One is ever available to you sending your support of $5 or a little more to this following PayPal link. I’ll then send you a fully illustrated PDF file attached to the email you used to make the donation. Thank you. This entry was posted in Global Warming and tagged Anthony Bourdain, Bourdain Suicide, Brett Kananagh, Carr fire, climate change, constitutional illiteracy, Crown Prince Muhammad bin Salman, Donald Trump, Freedom Forum Institute, global warming a hoax, good germans, Greek fires 2018, Hitler, Hogue, Holy Fire, hottest low, hottest low in recorded history, hurricane season forecast, Iran, Justice Kennedy, Justice Kennedy retires, Mabus, MBS, megafires 2018, Middle East, Mohamed bin Salman, Muhammad bin Salman, Napoleon, Nostradamus, political illiteracy, POTUS, prediction, predictions, prophecies, prophecy, record-breaking temperatures 2018, red hot planet, red hot planet 2018, Roe v. Wade, Saturn in Capricorn, Saudi Blocade, Saudi blocade of Yemen, SCOTUS, Snowercane, Third Antichrist, Trump, Trump tweets, Typhoon Maria, Typhoon season 2018, Uranus in Taurus, US midterm elections, weather channel, woman's right to choose, Yemen cholera, Yemen civil war, Yemen genocide, Yemeni famine. Bookmark the permalink. Post a comment or leave a trackback: Trackback URL.